Congestion pricing is good for the environment and public health. Photo by dlisbona. A team of scientists at the London School of Hygiene and Tropical Medicine and King’s College London conducted a study showing that London’s congestion pricing scheme has reduced air pollution in central London, saving Londoners as a whole 1888 extra years of life. The study focused on two types of pollutants from cars: NO2, a chemical compound known to cause acute and chronic bronchitis, and particulate matter (PM10), tiny particles suspended in the air which can become embedded in the lungs, causing asthma and bronchitis. The authors of the study, which was published in the journal of Occupational and Environmental Medicine, are hardly sanguine about their results, noting that overall London saw only “modest” reductions in NO2 and PM10 levels. 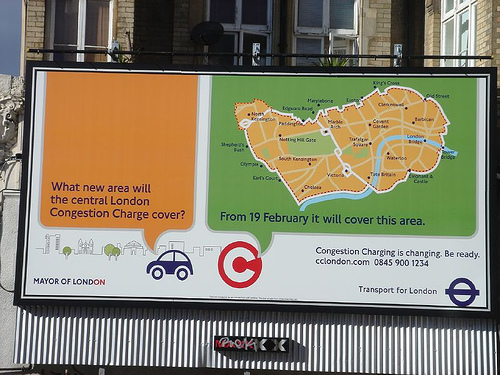 However, they also point out that, “Absolute and relative reductions in NO2 and PM10 were greatest within the congestion charging zone wards,” suggesting that an expansion of the zone would have an even greater environmental and health impact. The public health dimension of the study puts a new spin on Mayor Ken Livingston’s environmental initiatives, like bike sharing and pedestrianization, which he has linked to his campaign to fight global warming. “Evidence from epidemiological research indicates exposure to traffic is associated with a number of adverse health impacts including mortality, myocardial infarction, and impaired lung development in children,” the researchers warn. Read the study – “Air pollution and mortality benefits of the London Congestion Charge: spatial and socioeconomic inequalities” – here.